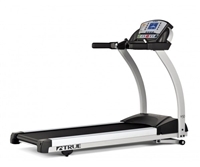 Recognized by Consumers Digest as a “Best Buy” in 2010, the TRUE PS800 is the perfect example of stylish home fitness equipment that has your best interests in mind. Not only does the PS800 deliver the quality that TRUE is known for, it offers additional safety features to make it the perfect piece for any room in your house. The PS800 offers one of the largest running surfaces in the industry. This, along with the handrails, makes this a piece of fitness equipment that keeps your family’s safety in mind. Matrix's Johnson Drive™ System helps you stay in perfect rhythm with a quiet, durable, responsive 3.25 HP continuous-duty drive system that recalibrates with each footfall. The extra-long 152 x 51 cm/ 60" x 20" running surface provides the most room to move on Matrix's exclusive Ultimate Deck™ System that includes a heavy-duty frame, extra-thick deck and industrial-grade cushions for miles of durable performance. Our welded steel frame provides excellent stability for users and workouts of all kinds, offering the most true-to-life running experience on the home fitness market. Our Ultimate treadmill console features a 16" Class HD touchscreen with Simple, Track, Virtual Active, Change Workout, Weather, My Media, Web Browser aps (other apps vary by market) as well as eleven preset programs to help get you started on your workouts right away. The T50-XIR is also compatible with the Passport™ media player, which is sold separately. Our industrial-grade 3.0 HP continuous-duty AC motor provides efficient, durable, responsive performance — minimal internal components require little maintenance, and an absence of internal friction keeps the motor cool and quiet. The extra-long 152 x 56 cm/ 60" x 22" running surface provides the most room to move on Matrix's exclusive Ultimate Deck™ System that includes a heavy-duty frame, extra-thick deck and industrial-grade cushions for miles of durable performance. Our T75 belt is designed with a proprietary wax application process that automatically lubricates as you run, eliminating the need for routine silicone lubrication. Our welded steel frame provides excellent stability for users and workouts of all kinds, offering the most true-to-life running experience on the home fitness market. Our Intuitive treadmill console features a 10" Class touchscreen with Simple, Track, Virtual Active, Change Workout, Weather aps (other apps vary by market) as well as ten preset programs to help get you started on your workouts right away. The T75-XER is also compatible with the Passport™ media player, which is sold separately. Our industrial-grade 3.0 HP continuous-duty AC motor provides efficient, durable, responsive performance — minimal internal components require little maintenance, and an absence of internal friction keeps the motor cool and quiet. The extra-long 152 x 56 cm/ 60" x 22" running surface provides the most room to move on Matrix's exclusive Ultimate Deck™ System that includes a heavy-duty frame, extra-thick deck and industrial-grade cushions for miles of durable performance. Our T75 belt is designed with a proprietary wax application process that automatically lubricates as you run, eliminating the need for routine silicone lubrication. Our welded steel frame provides excellent stability for users and workouts of all kinds, offering the most true-to-life running experience on the home fitness market. Our Ultimate treadmill console features a 16" Class HD touchscreen with Simple, Track, Virtual Active, Change Workout, Weather, My Media, Web Browser aps (other apps vary by market) as well as eleven preset programs to help get you started on your workouts right away. The T75-XIR is also compatible with the Passport™ media player, which is sold separately.